Many Thais and Westerners were revolted by the spectacle and worried by the hygiene implications of the recent blood-spilling on Bangkok’s streets. Some denounced the sheer wastefulness of a precious resource which could have been used to help the sick. 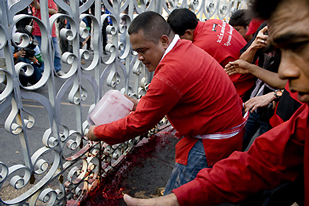 But red-shirt leaders said the blood spilling was a sacrifice for democracy and a curse on the government. While a lot of the same concerns went through my mind, such as the hygiene issue, I told myself there must be some cultural explanation. It seems I was right. In the battle for Thailand’s political soul – played out over several years by “yellow” and “red” waves of protesters – symbolism is probably the most important weapon. A powerful belief in astrology and the supernatural (‘saiyasat’) co-exists alongside an increasingly commercial, globalised culture. This is not just a frame of mind found in far-flung rural areas. Many of the country’s top leaders, civilian and military, have actively participated in magical rituals to seek special powers and enlist them on their side. The rest of the story attempts to explain this mysticism, but the important thing to understand, it seems, is that we must be careful not to judge a protest in a different part of the world based on our own cultural practices. That’s not to say the blood protest was the right tactic for the red-shirts to take. It simply means that we must judge it on the cultural standards of the Thais. Hopefully that kind of analysis will surface soon. Hi! This is my first time on your blog. Got some good stuff here. I am trying to track down a rumor I keep hearing about. I have read the Chinese government had a hidden clinic near Stung Treng. They were supposedly testing some hallucinogenic drug like acid that made you think you were having an out of body experience. Anyone have any info about it? Amazing chat. I like it I truly appreciate the way you talk about this subject matter Few people are willing to put in this much effort to figure out a authentic choice.